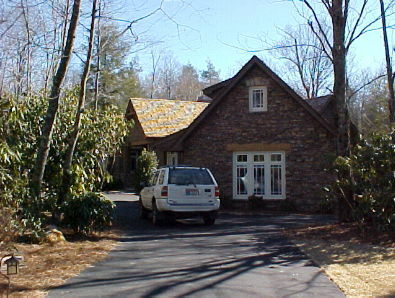 Home in Cullasaja Club, Highlands, NC. Craftsman style architect creates arts and crafts home in Highlands, North Carolina in the Cullasaja Club community for clients from Texas. Rand Soellner, a Highlands NC architect and Cashiers, NC architect, first received a call for help from this homeowner when he realized that the home he had paid a “residential designer” to create wasn’t the home he wanted. He wanted a licensed professional with experience as a Craftsman style architect to rescue his project. Although Rand Soellner Architect no longer accepts commissions to “fix” other’s design work, Soellner revamped the entire exterior appearance as well as refined interior arrangements and finishes. The result: the client was delighted with the renovated design, which was carried through the construction to his satisfaction. (C)Copyright 2003-9 Rand Soellner, All Rights Reserved Worldwide (all images and text on this page). 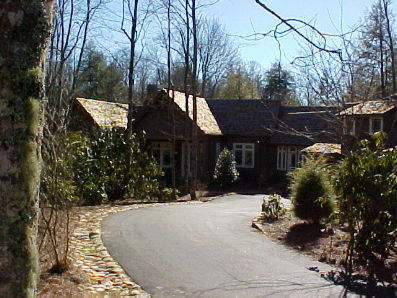 Highlands, NC architects, Lake Toxaway NC architects, Brevard NC architect. As Cashiers architects, we are centrally located to handle all projects all over the Plateau. 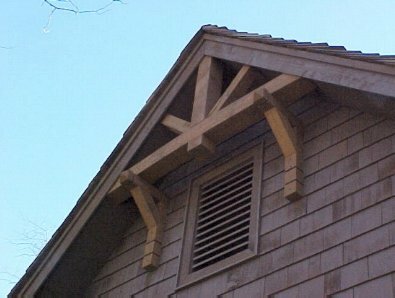 Craftsman Style gable peak bracing and bracketry detailing by the home architects. Garage end wall faces street, so the Craftsman style architect improved the aesthetics, changing the direction of the roof ridge of the office over the garage and adding craftsman style windows in the office and the garage, itself to improve the appearance. Stone arch over the upper window enhances mountain appeal, as does the large granite lintel over the lower windows. 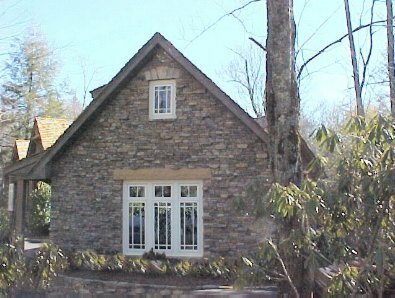 The Craftsman style architect designed the driveway with stone side curbs and had some gentle clearing accomplished for visibility of the front porch and front door and added several 12/12 mountain style gable roofs to enhance the aesthetics of the front elevation. The result was a charming mountain estate of which the owners can be proud. Arts and Crafts post details with stone pedestals (one of Rand Soellner Architect’s trademarks) further enhanced the appeal of this house right where people can see it to best effect: at the Front Porch. 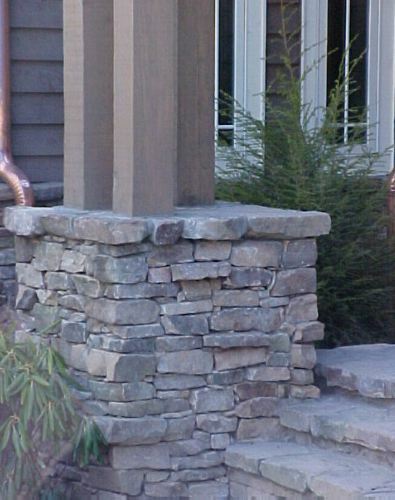 Rand likes to specify 5″ thick native stone in a drystack setting bed for a “Rustic Elegance” style that most people seem to appreciate with Craftsman style architecture. 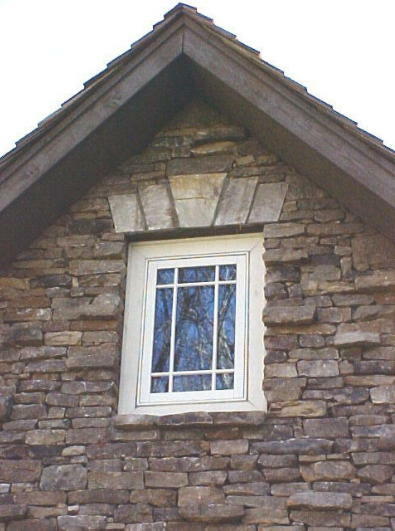 Here is a blow-up detail of the stone archwork over the top gable window in the home office over the garage. Note Rand’s 9-lite Prairie style grille in the casement window and the projecting stone sill. A Craftsman style architect knows how to handle luxury residential architecture. A better view of the garage end wall overall. Notice how the autumn color palette blend with the surrounding trees, plants and natural forest ground cover. Rand Soellner typically provides Craftsman style architectural detailing on his homes’ garage doors. 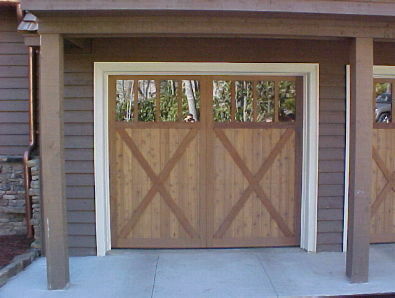 Here, a stable X-brace pattern with vertical planks was used. The idea is to make it appear that the doors are side-hinged and that at any moment, they might slam open and a horse-drawn carriage will burst out, on the way to town to obtain this month’s provisions. As a custom home architect, Soellner has created many projects spanning the Country and also has designed projects overseas. He is interested in designing your custom home, wherever you project site may be located. Soellner is a mountain homes architect and also designs projects for a variety of non-mountainous locations and is available to design homes for project sites in: Sedona Arizona, Calgary Canada, Anchorage Alaska, Nashville Tennessee, Daniels West Virginia, Chicago Illinois, Indianapolis Indiana, Oxford Ohio, New York New York, Paris France, Moscow Russia, London England, Sao Paulo Brazil, Sydney Australia, Tulsa Oklahoma, Tallahassee Florida, Boise Idaho, Asheville North Carolina, Hendersonville North Carolina, Greenville South Carolina, Atlanta Georgia, and other places, wherever you are. 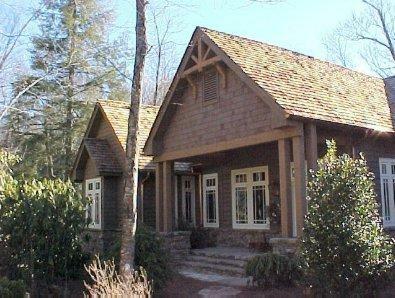 tags: craftsman style architect, mountain homes architects, highlands, Cashiers NC architect, Brevard Architecture, timber frame, post and beam, open plan design, resort home, stone mansion, mountain lodge, cottage, arts and crafts, log cabin, healthy design, castle, destin, atlanta, sylva, waynesville, glenville, tucson, jackson hole, mobile, hilton head, grand junction, lake tahoe.